The motor cortex in the human brain is mapped to match specific body parts. 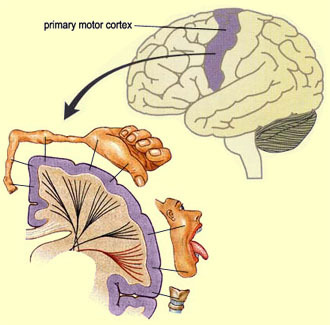 Body parts with more devoted cortex area are generally more sensitive or have finer motor control. Imagine slowly losing control of your muscles, first with a few twitches in your arms and legs or a slurred word here or there. Muscle failure will continue until it eventually stops your ability to move, speak, and breathe. This is the life of a patient suffering from amyotrophic lateral sclerosis (ALS) also known as Lou Gehrig’s disease, a progressive neurodegenerative disorder. Currently, there is little treatment for the rapid course of this disease, but James Weimann, PhD, of Stanford Medical School provides a new hope. Weimann is part of a team of neuroscientists using transplanted neurons grown from embryonic stem cells to replace damaged cells in young animals. This finding is the first of its kind in that the stem cells can be directed to take on the jobs of specific brain cells while also making the correct connections with other cells. Weimann’s cells transmit information from the cortex, the neural tissue that is outermost part the mammalian brain, specifically areas needed for motor function. Up until this point, the issue of stem cell transplantation in the brain was making the proper neuronal connections. As an adult organism, creating the accurate connections in the nervous is extremely complex. During development, superfluous neural connections deteriorate with lack of use. Only the pathways with the most activity remain in adulthood. The chemical or physical signals that once lead the way in development are no longer present. Without such cues, it is difficult for neurons to reach their target areas. For example, the stem cells created in Weimann’s lab must make connections with motor cortex in order to be an effective treatment for disorders like ALS or a traumatic brain injury. Incorrect connections could result in further erratic brain function. A step in the processing of human embryonic stem cells. While Weimann’s work holds a lot of potential for further progress and treatments, the studies have involved transplantation in young animal models. Since the majority of neurodegeneration takes place in older adults, the next step will be to explore stem cell transplantation in adult animals. Weimann and his team are hopeful that these newest findings will soon be used in treatment of neurons that are lost or damaged due to spinal cord injuries or diseases like ALS. Weimann is part of a team of neuroscientists using transplanted neurons grown from embryonic stem cells to replace damaged cells in young animals. nly the pathways with the most activity remain in adulthood. hey,you have posted such a effectful article that it will certainly help me. While Weimann’s work holds a lot of potential for further progress and treatments, the studies have involved transplantation in young animal models. Only the pathways with the most activity remain in adulthood. Monday is a very important date, because the topic of was finally brought up. I looked everywhere to find things related to traumatic injuries , and finally I found it! Going to get a cup of Coffee and read on. is a subject that I am interested in. Its very hard to find articles related to traumatic injuries , but finally on Tuesday I did it, Yeah! Let me get whats left of my pizza and finish reading. This research sounds extremely interesting. I am sure that if this became a viable solution to treat ALS, pharmaceutical companies would be clambering over themselves to get hold of the process’ involved to create anti-ageing stem cell treatments similar to what is described in this article…. car shipping and auto transport company with safe auto transport service for your. download progressive house music dj mix tech house, progressive house and. car shipping and auto transport company with safe auto transport service for your needs. car shipping and auto transport company with safe auto transport service for your great article happy now thank you. This is a very good article, it sounds very interesting you must have done quite a bit of research on this. Thank you very much for the info. search engine optimization, seo, search engine marketing, sem, seo services, local seo, link building, . executive jet private jet, charter flight, air charter, jet charter, business jet, executive jet leads. Great site you have here. I really enjoyed all of the insightful information you’ve provided us with and look forward to read more on this site in the future. ALS is the disease recently coined by the modern scientists with great emphasis on recovering those dead cells that is infected by the some kind of viruses. Great works and keep going on. The advancement of medical field is obviously happening. Thank for this new studies that will lead to cure ALS. Looking forward for the success of this and I hope that soon they will discover also the cure for Cancer and HIV/AIDS. This research study is at least giving hope to patients with spinal cord injuries or ALS by showing that the fatal disease may be treatable. Can’t wait to see how this study will progress. Thanks for the share! It is a adorable moment when we get some knowledge about our body parts at inner and its working. To become a good doctors should have a lot study in medical line. Thanks for sharing this awesome post with us.